Veganism–Not Healthy in the Long Run? Vegan diets are getting more coverage in the press than ever before. Back when I first became vegetarian in 1986, I didn’t know of hardly anyone else who was vegetarian and the word vegan wasn’t even coined yet or at least I didn’t know about it at the time. Yet, even though there are more choices and alternatives available to those on vegan diets than ever before, the vegan diet still remains highly controversial and not just because of the ethical reasons. The main reason, I feel, that people try a vegan diet nowadays and then go off of it, is for health reasons. And yet, it seems that as many people are falling off a vegan diet as those converting to one. Why is this? Well, the main problem is the veganism is defined by what one DOESN’T eat, not by what one SHOULD eat. A “vegan” doesn’t eat animals. A whole-foods plant-based person eats just that: plants in their whole, natural state without any added chemicals. This label leads to major problems. Because, quite frankly, one can be vegan while eating donuts, drinking beer and soda and smoking cigarettes. Yet that will not lead to a healthy life. Nor will eating lots of white flour, GMO corn, sugar, gluten-containing grains, salt or soy. And yet, those foods are exactly what many vegan foods are made of. People have vegan pizzas, hot dogs, burgers, ice cream, candy, soft drinks, pastries and more. And, even if they do attempt to eat a “whole foods” diet, one that is comprised of whole grains and lower in processed foods, vegan diets are often high in fats and salt, not to mentioned GMO corn, soy and wheat. And pesticides if not eaten organically. The bad thing about this is that people want to look and feel healthy. And many vegan foods do not contribute to good health. A sound vegan diet needs to have as its foundation fruits and vegetables, preferably 80% of one’s diet and raw, with some whole grains like quinoa and rice and root veggies like sweet potatoes added in occasionally. Salt and fats need to be kept at a minimum. So, if you meet someone who is “vegan” and they don’t look healthy, you now know why. There are a lot of meat eaters out there who eat a “healthier” diet of unprocessed foods and lower-salt and white flour and sugar by eating their steak, vegetable and potato dinners. Vegan diets should just be replacing that steak with more vegetables or clean carbohydrate sources that don’t have a lot of added chemicals. Vegans are good in seeing their obligations to the well-being of animals, and yet vegans also need to see that they have obligations to themselves and to others by showing how the vegan diet is superior for building health by being a good example of health . Being careful with the lives of animals while being reckless with their own lives by eating processed foods doesn’t help anyone. So the focus needs to change to encompass compassion, not just for animals, but also for the well-being of HUMANS. And we need to come out of denial about processed foods being “okay” to eat for human health. In the long run, a whole-foods, high-raw, organic vegan diet is in fact great for longevity and quality of life in one’s later years and in the long run as long as we eat as close to how food is grown in nature as possible. But a junk-food, processed vegan diet is a quick way to become unhealthy very quickly. And nobody wants that. Even IF no animals were suffering in the process. Because WE need to be healthy, too. The other thing that needs to be addressed in order to be a good example of health is stress-management via exercise and relaxation techniques because stress, regardless of one’s diet, can age one quickly and break down one’s body. No matter how clean or healthy one’s diet, a high-stress life can wreak havoc on one’s health and then of course anyone who knows the vegan will point to the diet as the culprit even though meat-eaters get just as many nervous break-downs from stress as vegans do. 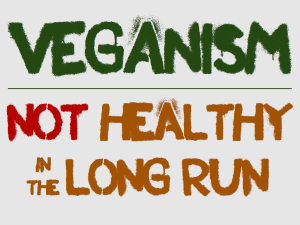 If you are passionate about veganism for animal right’s issues and want people to be drawn to this lifestyle, then attract through being a glowing example of health by walking your talk and SHOWING people that this lifestyle will improve their lives. That will be the most powerful motivator for most people. Get enough exercise, get enough sleep, manage your stress and eat clean.